Mint green tourmaline earrings in 18ct yellow gold. Bespoke earrings designed and made as unique studs for these unusually coloured mint green tourmalines. The tourmalines are cushion cut and beautifully facetted to reflect the light, giving twinkle to these sparkly earrings. The gems are approximately 8mm across, making the whole earring about 12mm. 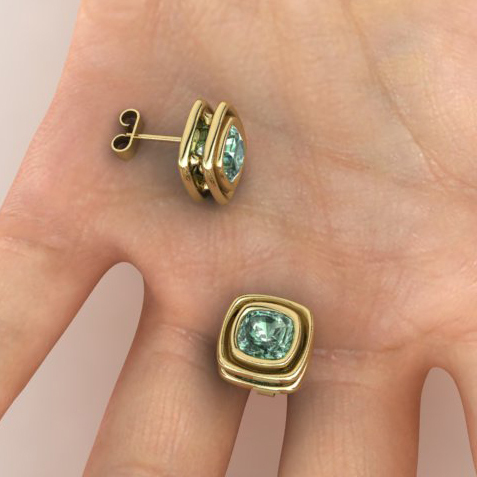 We designed the frame around the mint green tourmalines, to have a secondary rim, which we feel, highlights the soft-square shape that you get with the cushion cut. Tourmalines are a precious gem, which naturally appears in many colours. Because of the vast number of colours that it is found in, ( pink, red, yellow, brown, green, blue, violet, black and multi-coloured,) tourmaline can often be confused with other gemstones. It is suitable for jewellery use and rates at 7 – 7.5 on the Mohs’ hardness scale. We designed these earrings with a double gallery. i.e. They have enough depth for the tourmalines to sit flat to the ear, without them sticking into the lobe.